EREMA gave some 100 international journalists a deep insight into their trade fair plans for K 2016 at the official "K Preview" press conference on 29 June in Düsseldorf. With CAREFORMANCE the global market leader is all set to herald the age of Recycling 4.0 as the first in the plastics recycling industry to present an extensive Smart Factory package for both recyclers and producers. Recycling 4.0 is no future trend, it will be reality starting at K 2016. 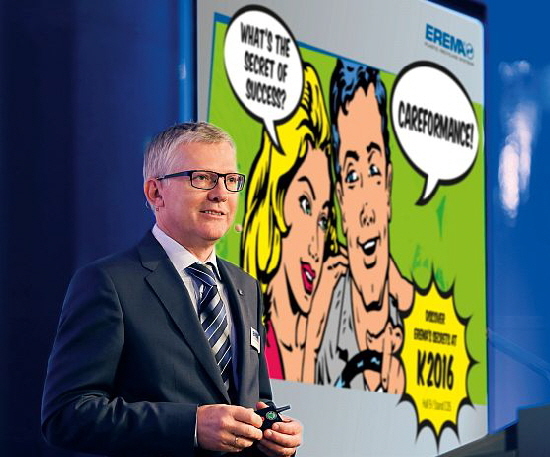 At the K 2016 show EREMA will be building on the success of the INTAREMA® technology presented in 2013, this time with its trade fair theme of "CAREFORMANCE – We care about your performance" to grow its pioneering role this year with Industry 4.0 applications. "Building on the high degree of automation of the INTAREMA® systems we have developed a Smart Factory package which enables us to give our customers a clear competitive edge and make them fit for the future," reveals EREMA CEO Manfred Hackl. Trade fair visitors will not only discover the benefits of CAREFORMANCE in theory, they will also experience them live: EREMA will be recycling the plastic waste of the K show on site at the CAREFORMANCE Recycling Centre in the outdoor area of the trade fair, with machine, quality and process data being transferred in real time to EREMA's booth in Hall 9, Stand C05. CAREFORMANCE consists of 4 components, with the INTAREMA® system forming the basis for the further Smart Factory applications. In addition to the previous machine data, specially integrated sensors – the QualityOn package – can be used in future to record and evaluate MVR (Melt Volume Rate), colour and moisture. The QualityOn package enables recyclers and producers to make their recyclates with consistent quality in accordance with the special requirements of their customers and document them transparently using online data acquisition and analysis. Recipes recorded electronically can be compared with each other and modified. In order to make use of the vast amount of machine, quality and process data in a worthwhile and user-friendly way, EREMA has developed a sophisticated MES (Manufacturing Execution System). With re360 you can keep track of the productivity of an entire range of machinery in five modules. "A key benefit of re360 is that it works independently of the plant manufacturer," emphasises Manfred Hackl. "Customers can integrate not only different systems but also their global production locations." re360 gives you an overview of the capacities/stoppage times of the systems for management, documents key quality data of the recyclates for the location manager and informs the operator about upcoming maintenance jobs. The extent to which re360 was developed with customer requirements in mind becomes clear with the link to Spare Parts Online, EREMA's online webshop. Any upcoming maintenance work and the replacement of individual parts is displayed in good time by re360. Spare parts can be ordered directly via the online webshop to keep downtime as low as possible: interconnection in the sense of maximum productivity. The customers' respective EREMA systems and previous orders are stored at Spare Parts Online. At the last K 2013 EREMA launched a system with new core technology and additional innovations: INTAREMA®. The primary innovation is based on Counter Current technology. INTAREMA® achieves unrivalled process stability while maintaining flexibility with extremely easy operation and considerably less energy consumption. This stability enables automation processes such as Smart Start or the Recipe Management System, which in turn form the basis for modern Industry 4.0 applications. Since the technology was launched in autumn 2013 more than 450 INTAREMA® systems have already been sold worldwide. 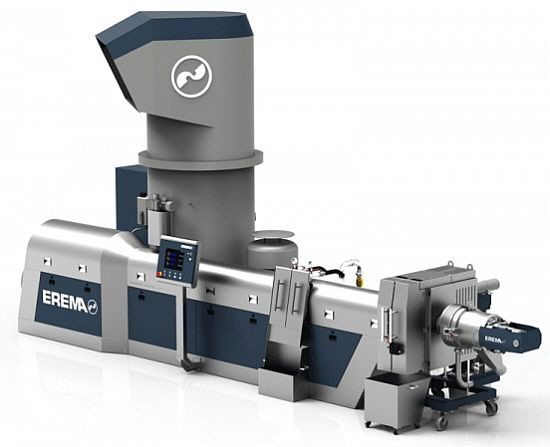 The company EREMA Engineering Recycling Maschinen und Anlagen Ges.m.b.H., which specialises in the development and production of plastics recycling systems, was founded in 1983. Besides EREMA itself, the EREMA Group comprises the sister companies 3S, PURE LOOP (January 2015) and UMAC (beginning of 2016). With subsidiaries in the USA, China and Russia plus around 50 local representatives in all five continents, the EREMA Group has a reliable network to realise customised recycling solutions for international customers. Around 480 people around the world now work for the Austrian company group which is headquartered in Ansfelden near Linz. Visit us at the K show 2016. We are looking forward to welcoming you on our stand (hall 9, stand C05).